What better way to transport writing utensils, art supplies or toiletries than with this rugged, sophisticated pouch. With a burnished gold zipper and tassel, it's a gift of form and function that's equally easy on the eyes. One Zippered Leather Utility Pouch. Complimentary Embossing on Leather Surface. Your gift is securely wrapped to safeguard the shipping process. A free card with your personal message is included with your gift. Free Embossing! Select three initials to be engraved on the leather enclosure's surface. Enter information to be embossed using the personalization option during checkout. 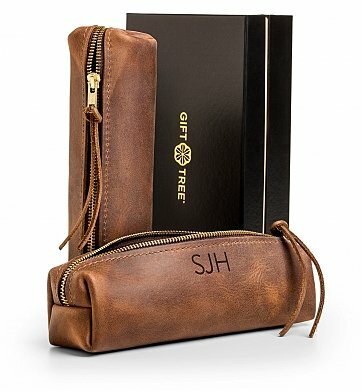 Embossed Leather Utility Pouch is a hand delivered gift. These gifts are delivered by one of our local design centers located throughout the United States and Canada. Same day delivery is available for most gifts when ordered before the cutoff time. The cutoff time for Embossed Leather Utility Pouch is 2 PM in the recipient's time zone. Genuine brushed leather utility pouch, handmade in the USA. Complimentary embossing of your chosen initials on leather surface. Every guy needs this utility bag and I've given it to three guys so far and they all love it! My first purchase experience with Gifttree was surprisingly pleasant. Their customer service was very nice, friendly and patient. No long waiting or annoying menu options. The personalized purchase was shipped out same day and delivered on time. The quality of the product was great. Overall, I was impressed and would buy again and recommend to my friends. This item was purchased as a gift and surprise and they were very excited and loved the gift. Thank you! This item is truly elegant and classy! I was very pleased and so was the recipient. Thank you for your prompt delivery.